I’m finally jumping on the train and binge-reading these books all the way through. And while it took me a while to get into The Raven Boys and I was not entirely sold at first, The Dream Thieves has me questioning my own sanity on that impression. This book was AMAZING. I was immediately sucked in to the story and flew right through it. You know some books draw you into their story so deeply that you forget the entire outside world while reading? This is one of those books. It may be too early to tell, but this may become a new favorite all-time series. The writing is absolutely gorgeous and one of the most atmospherically beautiful writing styles I’ve ever read. Honestly, it does take some getting used to and that is why I did not like The Raven Boys at first. But oh man, do I love the writing style now! It’s completely unique and lyrical and just completely breath-taking. The characters are some of THE BEST CHARACTERS I have ever read about. They are so realistic, flaws and all, that they actually feel like real-life people. Except you know, they’re not. But because they feel so real it’s just so easy to fall completely in love with them. I don’t often love book characters as much as I loved these characters. And I can’t even choose a favorite. One scene, a character would say or do something to make me fall in love with them and proclaim them my favorite, but then the next scene someone else would do something equally favorite-worthy and it just went on like that for the whole book. This book does focus on Ronan a lot more than the previous book, which is definitely a good thing. I was not a fan of Ronan before, but seeing things from his POV really does give the book a lot of its’ beauty. That said, I still love Gansey, Adam, Noah and Blue just as much. Also, The Gray Man? I need more of him. Just saying. And of course all the ladies of 300 Fox Way. Speaking about these ladies, can I just say how much I love the family aspect in this? Not just Blue’s family, but Ronan’s and Gansey’s as well. Not only are they present in a big way, but I especially love how we get to see so many different types of family, and just like the characters, they are all so flawed but that is part of what makes them so lovable. Another aspect that is done so, so well in these books? The romance aspect. I love how it’s not overpowering to the story at all and there are just these tiny little hints spread throughout the book in a subtle way. There is the big, epic and doomed love story that has been hinted from the very first line of book one that is finally coming into play. There is another one that has me swooning with every subtle and gorgeous reference. And there is a kiss that is so beautiful and so meaningful to both parties that it had me tearing up just reading about it. But if beautiful writing, amazing characters, character development and relationships are still not enough to sway convince you to read this book or start this series, then here’s one more: magical realism. I’m a big fantasy nerd. I love big epic stories with magic and dragons and evil kings and brave princesses. This is not one of those kind of stories and that’s maybe why it took me a while to get into it. It is magical and epic, but it’s just rooted a lot more in our present-day life. There’s school, the internet, cell-phones and crappy part-time jobs. But then there’s also psychics and magical ley lines and ghosts and magical forests and people who can take things out of their dreams. This book was just completely unique and wonderful and I can’t recommend it enough. If you’re like me and you had some trouble getting into The Raven Boys, please just continue on with The Dream Thieves. I’m pretty sure it will win you over in no time. “One moment, she was wearing clothing, and the next moment, she was wearing a bikini. Fifty percent of the world was brown skin and fifty percent was orange nylon. From the Mona Lisa smile on Orla’s lips, it was clear she was pleased to finally be allowed to demonstrate her true talents. A tiny part of Gansey’s brain said: You have been staring for too long. 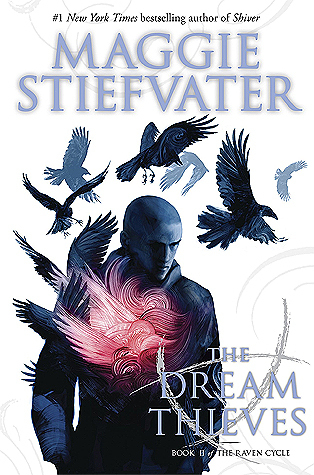 Have you read The Dream Thieves? What did you think about it?